A quick-casual restaurant with helpful service, Standard Sweets & Snacks has an impressive variety of tasty Indians desserts -- including chocolate burfi! Vegetarian lunch and dinner platters are also available. The Details: We were on a quest for chocolate burfi. Nick insisted he had once found a restaurant in Artesia with this holy grail dessert that fused together the traditional Indian condensed milk treat with Nick's favorite food of all-time, chocolate. I was skeptical -- burfi (also spelled "barfi," but, umm...I'm not recommending anything that says "barf" right in the title) is typically flavored with Indian ingredients like pistachios or coconut, not with foreign items like chocolate. Still, the hunt was on. After peering into a few different windows of quick-service restaurants (that much, Nick could remember), we walked into Standard Sweets & Snacks. And, lo and behold, there was the elusive chocolate burfi in the case next to many other delicious looking desserts. Of course, when we saw all of the other dessert options, we couldn't help but order more than what we came for. 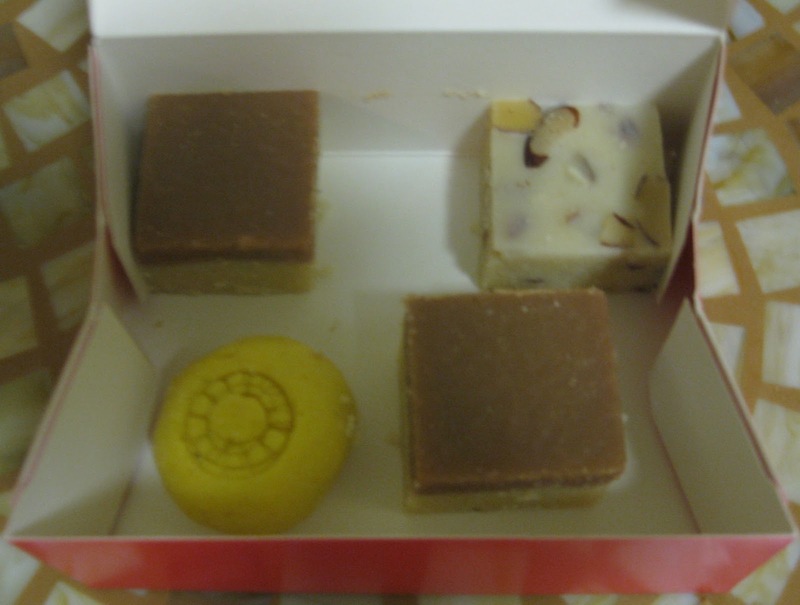 So, in addition to the chocolate burfi (left and right corner), we took home a nut burfi (I believe it was almond), and a sandesh (left corner; sandesh is a soft milk and sugar confection; this one was flavored with saffron, hence the coloring, but several other varieties are available). Nick also bought a chocolate cupcake (not pictured), which isn't Indian at all but, I guess he needed to satisfy his ever-expanding chocolate craving since he'd been talking about chocolate since before we went out for the night. I was impressed with the service here. The set up is similar to a doughnut shop, where all of the appetizing options are organized in neat rows inside a case. The sweets weren't labeled well (if at all), but when I pointed to a few, the employee was patient and explained what the differences were, such as why some were certain colors (usually due to a different flavoring ingredient). As we were rung up at the register, I was still confused as to how pricing worked, but I found out that most sweets here are priced at $7/lb. Our four sweets came out to 0.37 lbs., so we paid a mere $2.59. Nick's cupcake was $1.50. I would definitely recommend bringing a box of sweets from Standard Sweets & Snacks to an Indian-themed party -- they are tasty and impressive to ogle. Oh, and about that chocolate burfi specifically: I liked it -- but, honestly, it doesn't taste like chocolate. That layer tastes the same as the standard burfi layer, though it does add some visual interest to the dessert. I'm going to experiment with chocolate burfi recipes at home to see if I can develop one that truly tastes like chocolate-Indian fusion. And, for those of you who know the Jay Bharat brand name, this is a Jay Bharat restaurant. I only recently became familiar with this brand in the course of wedding research. Apparently, Jay Bharat is one of the most popular Los Angeles Indian wedding caterers. True to its name, Standard Sweets & Snacks also has a variety of savory Indian snacks available, including samosas, pakoras, stuffed poori, and more. Everything is vegetarian here, and they have affordable (under $10) lunch and dinner combos. I'm sure Nick will want to go back soon to try the puri (deep fried puffy bread), as that's another of his favorite foods. Have you tried the savory snacks -- are they are good as the desserts? And what other non-standard ingredients do you think would be good as burfi flavorings? I want to try some fusion recipe combos. Standard Sweets & Snacks, 18600 Pioneer Blvd, Artesia 90701. (562) 809-5009. Chocolate Burfee looks awesome. Can't wait to try it. Thanks -- I want to try to create my own chocolate burfi recipe. I haven't tried making any of the desserts just yet, because they tend to be more complicated than the entrees -- though burfi tends to be one of the easier ones. There are many varieties of folks that don dior replica. One of them varieties are generally folks that need to exhibit; they need to exhibit his or her individuality, his or her views, his or her sensations, his or her concepts. The truth is, by simply donning this specific rolex replica sale, they need to exhibit anything they must present. This also isn't undesirable issue. By simply donning this specific enjoy, these are offering the many attributes of their individuality. Transforming this specific in their go, it's not at all the individual that's taking your individuality beyond them selves by simply donning your hublot replica sale. In a very entire world wherever virtually all individuals who have enough money designer watches check out operate, enjoy firms get made his or her designer watches for you to fit in with this specific development. Almost all of the designer watches offered are generally focused in direction of people who operate. For the reason that breitling replica in the office are most likely to own cash to acquire this sort of goods. The benefit of needing this specific good quality available rolex replica sale any time people are taking into consideration getting a enjoy as a consequence of good quality, the 1st company as well as makes that they imagine are going to be your company that they invest in.